WEYBRIDGE, UK--(Marketwire - April 25, 2008) - Vanessa Winship from United Kingdom has been named Sony World Photography Awards Photographer of the Year, revealed at the VIP Gala Awards ceremony in Cannes. Her entry in the Portraiture category has beaten thousands of submissions to win the esteemed title, accompanied by a $25,000 cash prize. The final decision was made just hours before the ceremony by the Honorary Board, some of the industry's highest regarded members, including Nan Goldin, Bruce Davidson, Tom Stoddart, Elliott Erwitt and Martine Franck. Over the past weeks they have been deliberating upon the professional photographers' shortlist, chosen by the World Photographic Academy, and had a final meeting the day of the Awards to agree their decision. 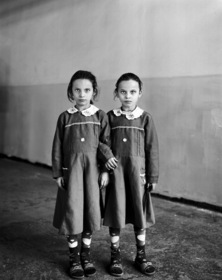 Vanessa Winship said, "Many, many thanks, and these are actually for the little girls of Eastern Turkey." Vanessa Winship received her award from Honorary Board Member Elliott Erwitt at the Palais des Festivals in front of an audience of 700 VIPs and industry leaders. The eleven professional category winners spanning eight countries also collected their awards and Arup Ghosh, the overall amateur winner, was applauded by the audience though was unfortunately unable to attend the ceremony. Phil Stern was awarded the Legacy award for his outstanding contribution to the industry. He said on receiving the award, "It is very flattering to have been chosen to receive this award. May I thank everyone who made this decision, and long may the awards continue." The Awards ceremony is the finale in a series of events in Cannes over the last few days, based on the theme of 'Legacy'. Focusing on the past, present and future of photography, this has included the Sony Legacy Exhibition, curated by Magnum Photos; a photography summit to discuss the latest industry issues; and 'University Shoot Out', a student initiative to support the future generation of photographers. James Kennedy, General Manager Marketing Communications, Sony Digital Imaging Europe said, "The Awards really are a showcase for the photographic industry at its highest level. It has been wonderful to be part of an event that brings together such phenomenal talent." Founder of World Photography Awards Scott Gray added, "This event is the culmination of what has been a fantastic first year for the Sony World Photography Awards. We thank everyone who entered and look forward to the second year already." The initial concept for the World Photography Awards was conceived over lunch in Cannes in autumn 2005. Founder Scott Gray identified with the Commercial Manager of the Palais de Festivals a substantial gap in the photography market for celebrating what had been a revolutionary decade in the industry. The result was an Awards ceremony that would mark the way forward for both professional and amateur photographers and set a precedent for future decades. Sony first entered the photographic market in 1989 with the release of one of the world's first digital cameras. Through the years Sony has continued to push the boundaries of excellence with each new addition to their range, including the market-leading Cyber-shot digital cameras and the Sony Alpha DSLR cameras. It is with great pleasure that Sony looks forward to the growing success of the Sony World Photography Awards in years to come. Saatchi Online was launched in 2006 in order to create a free global platform for artists all over the world to exhibit their work to a wide international art community. Now the world's largest interactive website, attracting millions of visitors each day, Saatchi Online showcases the work of over 80,000 artists and art students. The site has proven to be an invaluable platform for artists, facilitating sales of over $100 million in its first year. The website has enabled collectors to acquire work directly from registered artists, free of any commission, and dealers can also benefit by using the site to discover new artists working all over the world. The site also provides information on international museum and gallery exhibitions, a daily magazine, global art news, a live chatroom and regular competitions. Saatchi Online is ranked. Any objection to these terms and conditions is to be made in writing to Katie Reynolds at Idea Generation within five (5) days of receipt of the submission memo. As the recipient you agree to indemnify Idea Generation with respect to any claims or damages or any loss or costs arising in any manner from the reproduction, without proper reduction rights of any picture supplied to you by Idea Generation. While Idea Generation takes all reasonable care in the performance of this agreement generally Idea Generation shall not be liable for any loss or damage suffered by the recipient or by any third party arising from the use or reproduction of any Material. In case of printed publications, two copies of the relevant pages containing any material supplied are to be furnished free of charge within two weeks. Unless otherwise agreed in writing if any material reproduced by the media omits the copyright/accreditation notice relating to the material and specified by Idea Generation, a reproduction fee shall be administered per image. All copyright remains with the Photographer. Photo by-lines for each photographer with copyright symbol must run adjacent to any images thus: © Photographer's name; courtesy of Sony World Photography Awards. The name and date of exhibition must be credited at the beginning of any editorial. Full details on Sony World Photography Awards must be summarised below any images or at the end of any editorial including: Name in Full; Dates; Contact - Website. The use of images is to be used for editorial media purposes relating directly to Sony World Photography Awards; they must not be sold or used for any other purpose. Material shall not be altered, added to, have any part deleted or otherwise manipulated. Material shall not be copied or loaned, and no use whatsoever shall be made of it by the recipient without the written consent of Idea Generation. Save for the purpose of production for licence due photographs may not be stored in any electronic medium without the permission of Idea Generation. All usage of pictures must first be approved in writing by Katie Reynolds at Idea Generation.